At the Gagarin Cosmonaut Training Center in Star City, Russia, Expedition 55 backup crew members Nick Hague of NASA (left) and Alexey Ovchinin of Roscosmos (right) pose for pictures during a day of qualification exams Feb. 20, 2018. Credit: Wikimedia Commons. Two minutes after launching from the Baikonur Cosmodrome in Kazakhstan, an American astronaut and a Russian cosmonaut were forced to make an emergency landing after the Russian-made Soyuz rocket malfunctioned. 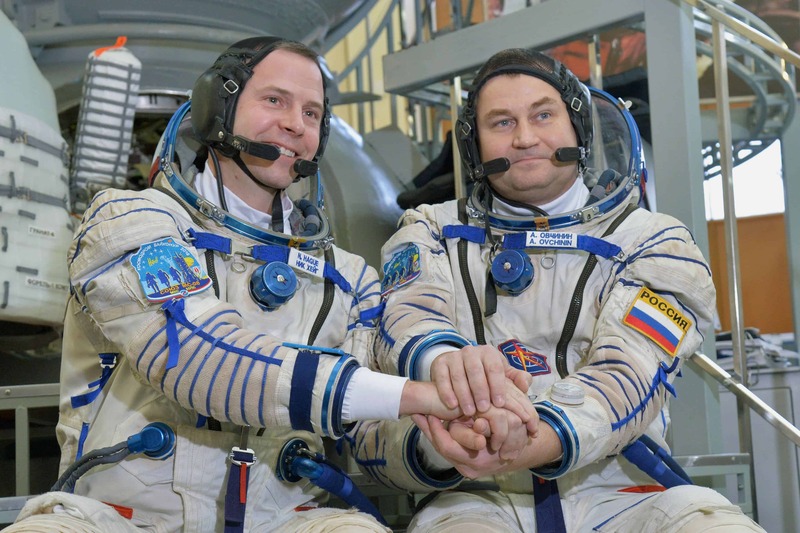 The team was en route to the International Space Station (ISS). Thankfully, Nick Hague and Alexey Ovchinin landed safely, without any injuries, although the ride was quite uncomfortable — to say the least. According to NASA, the problem occurred during the staging of the rocket’s booster. The Soyuz was supposed to discard its first stage booster, whose fuel was empty. Something went wrong during the separation between the first and second stages of the booster. The astronauts immediately reported a problem because they were feeling weightlessness instead of the expected g-force acceleration that should have pushed them back in their seats. The escape system was immediately activated, approximately 114 seconds into flight, and the crew’s capsule made a ‘ballistic descent’ — “a sharper angle of landing compared to normal,” according to NASA — then landed 400 km east of Baikonur. Russian space agency Roscomos also stated it is investigating the malfunction and will collaborate with NASA in the most transparent manner to get the bottom of things. In the meantime, all scheduled Soyuz launches have been suspended. The Soyuz is considered to be the most reliable spacecraft in the world in terms of its safety record. It has made 139 manned flights so far, the vast majority successful. Before today, the last failure was the 1983 Soyuz T-10a mission. The incident, however, will likely add friction to already strained relations between Roscomos and NASA. Space is one of the few areas where the US and Russia are still actively collaborating, but recent events are putting into question the Russian space industry’s capacity to meet today’s rigorous standards. In late August, a 2-millimeter hole, which suspiciously looked like it was drilled there, was found to be leaking air from one of the two Soyuz rockets docked at the International Space Station. NASA wanted to wait a couple of hours to test a solution on Earth but the Russians took it upon themselves to plug the leak and disregarded the American recommendations. The embarrassing little hole was eventually sealed by the crew — an operation which involved glue and duct tape — but at the expense of aggravating NASA. Roscosmos chief, Dmitry Rogozin, didn’t make things much easier after stating that the tiny hole may have been an act of deliberate sabotage. Since NASA retired its space shuttle in 2011, the Russian Soyuz has been the only space vehicle capable of sending astronauts to the International Space Station (ISS). NASA has been buying seats on Soyuz rockets ever since but next year SpaceX and Boeing should debut their launch systems capable of ferrying astronauts to and fro the ISS. Once NASA is free to work with other partners, the collaboration between the US and Russian space programs will likely be significantly renegotiated.